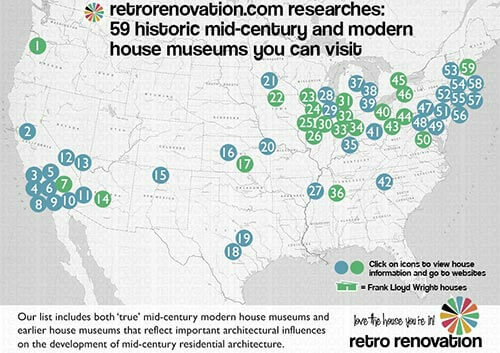 Our series on historic, mid-century homes open to the public continues. Continuing on the hunt for retro inspired Historic Homes you can visit I was reminded of Elvis Presley’s Graceland, located in Memphis, Tennessee. Of course I’d heard about this 14 acre white columned estate before, but I never could have imagined the lavishness (if that’s what you want to call it) in which Elvis decorated it. 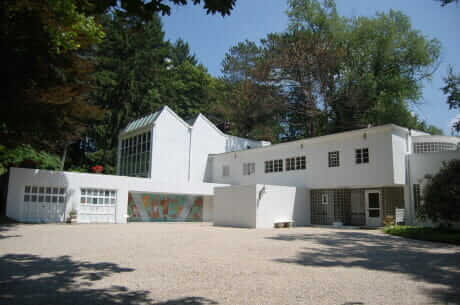 The American Colonial style mansion was originally built in 1939 for Grace Toot, heiress of a successful printing firm. Elvis bought the home in ‘57. He enjoyed the privacy and security Graceland offered — plus, for only $100,000 it was hard to pass up. 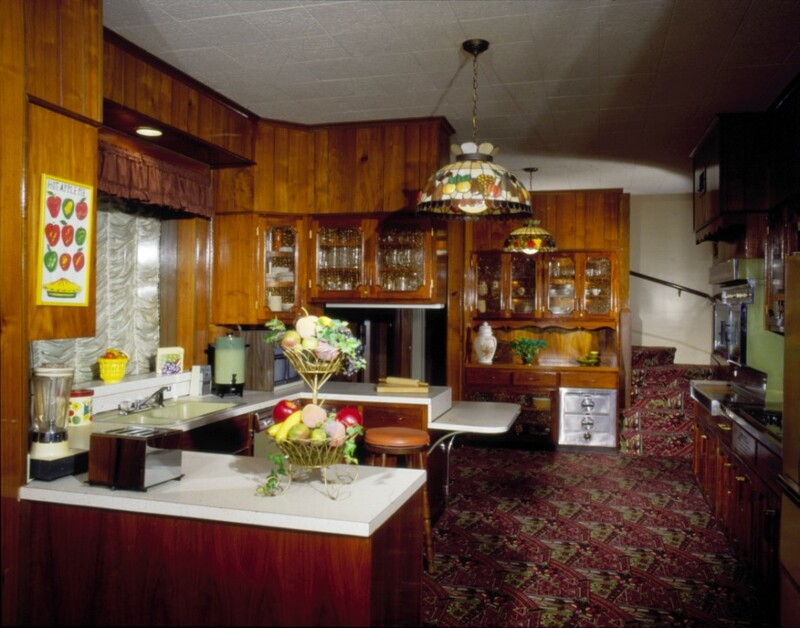 Elvis immediately began extensive renovations on the 23 rooms in the house & its surrounding grounds. He added the musical inspired wrought iron gate, a fieldstone wall to match the tan limestone on the home, racquetball court, swimming pool & the infamous jungle room. Finally, he designed & developed the meditation gardens — Elvis’ preferred reflection place — where his twin brother Jesse, parents and grandmother are buried. 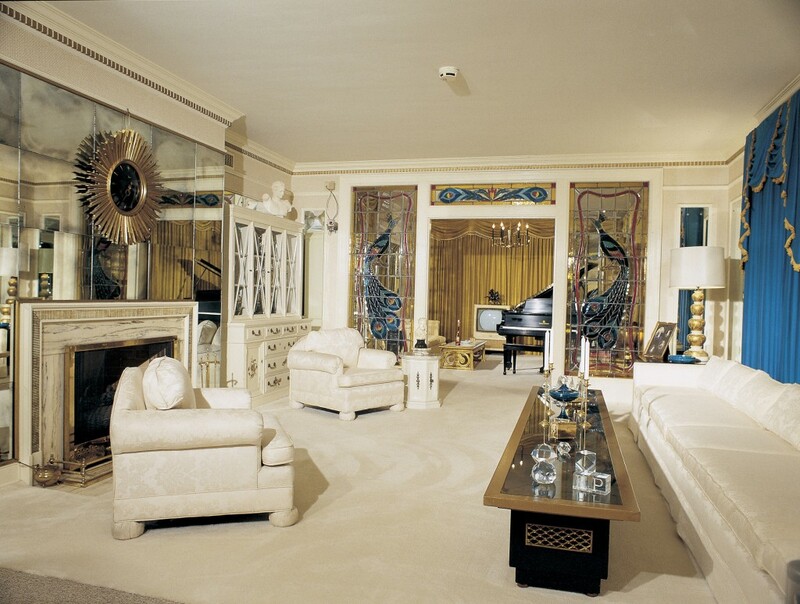 When you first enter the house there is a grand mirrored staircase front and center — Elvis’ personal design choice. Elvis’ parents lived upstairs until their death. 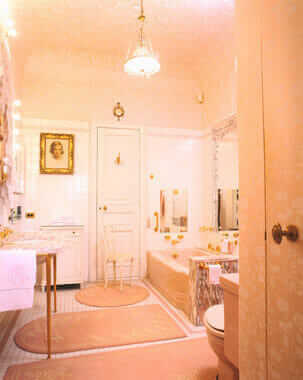 Although I have no pictures, the cleansing white theme is continued upstairs & there is a full pink bathroom. I’ll mention now in case you are seriously interested in visiting — most of the downstairs rooms, along with the upper floor, are roped off (no flash photo of course), but there are so many exhibits & activities you would not be disappointed. The combo living/ music room is the first stop on the tour. The white theme (which is predominant in most of the rooms) makes everything look so clean and crisp. It is only complemented by that giant 15-foot-long couch, where can you look at the gardens through the mirrors hanging over the fireplace. Off to the side is the adjoining music room where a totally retro TV & baby grand piano hide behind those amazing stained glass peacocks — in front of which Elvis’ coffin was placed for the widely attended funeral held at Graceland. I cannot explain you in words how much I love the yellow in this room. Complimented by the mirrors, the white, & gorgeous furniture…oh my! That even looks like a gold accented television set. Just a few steps down the main floor is this wonderful wood kitchen, which (along with the dining room) was used by Elvis’ Aunt Delta until 1993. When dealing with this much wood, you need to bring color through the accents and hardware. The bright fixture, copper cabinet pulls, and bowls of fruit does the for me in this kitchen. I can’t be positive, but I think that sink is yellow. This image really shows how much room this kitchen offers, it’s almost two rooms. They aren’t built in, but Graceland still has all the high tech appliances of the era. Off the kitchen is the dining room, the tours next stop, then down then stairs to where Elvis really showed his style. This dining room should belong to a king…oh wait it did. The blue in the curtains in so rich, it reflects just as much as the great white & black tile floor. I can’t get over the crystal chandelier and gold accented furniture — it would be such a dream to eat in here everyday. I love those arched built ins in each corner — this room would look much simpler without them. The tour takes you downstairs to the media room, game room and bar. 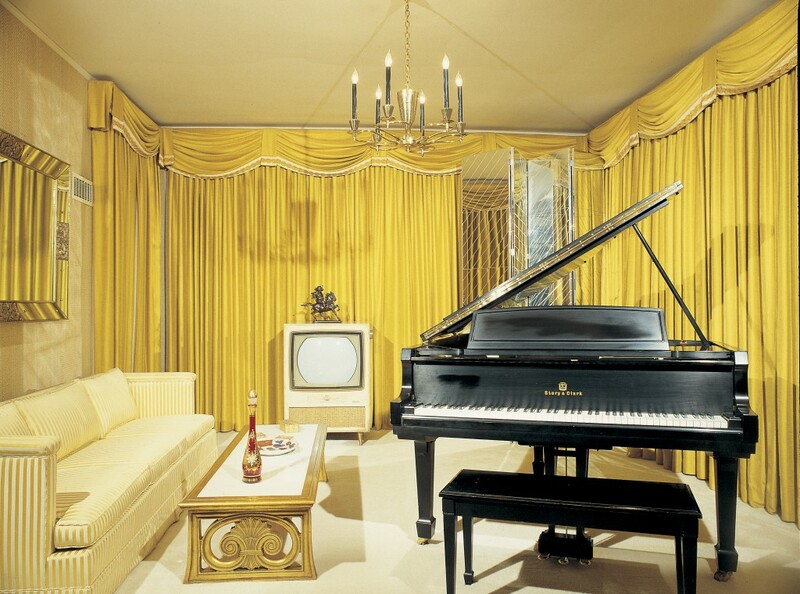 It is down in the man cave that Elvis’ brought his peculiar brilliance to Graceland. The media room holds three TV sets where Elvis would frequently sit and watch all at once — of course, always in arms length of the built in wet bar. Whenever he and his buddies had their fill they would move on to the billiards room. I love a lot about this house, but I don’t know if I could get used to all that fabric. It’s even on ceiling. I bet this room gets super toasty if you laid a fire in that fireplace. Back upstairs, the final room in the home is the famed Jungle Room. 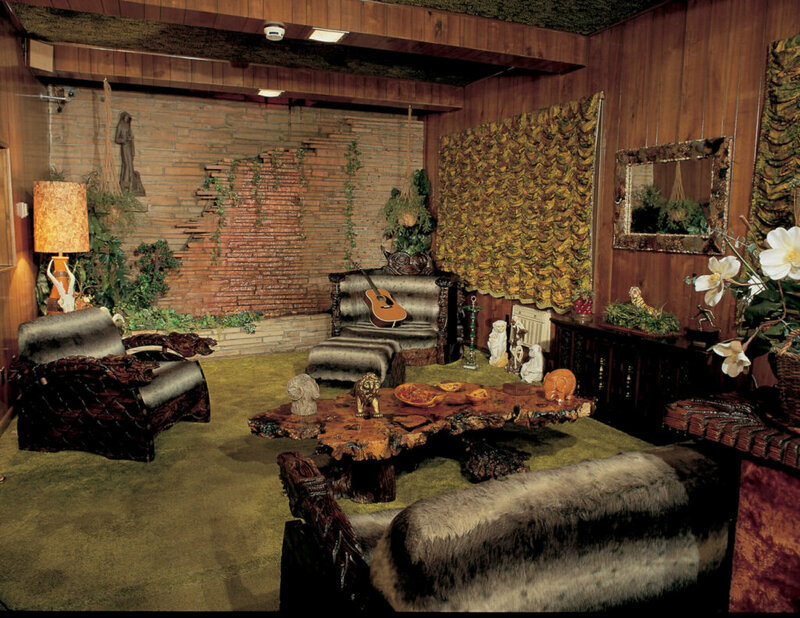 Elvis choose everything that went into this room, from the furs to the waterfall. He placed sentimental gifts & hung family photos. When Elvis’ was staying in hotels while he was on the road he would have them remodeled to be more like home for his stay. The Jungle Room was almost a template for how he would like his room to be. Although the tour of the home is over, out the back door are more exhibits including Lisa Marie’s swing set, a model of his childhood home, his father office building, Elvis’ shooting range, and finally The Trophy Room. 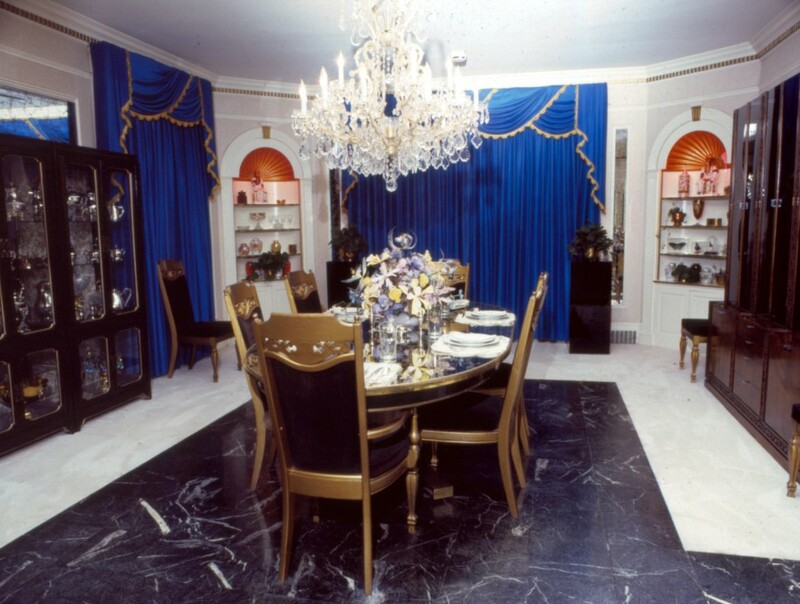 This room was built by Elvis to hold all the items that he had been awarded or held dear over his career. 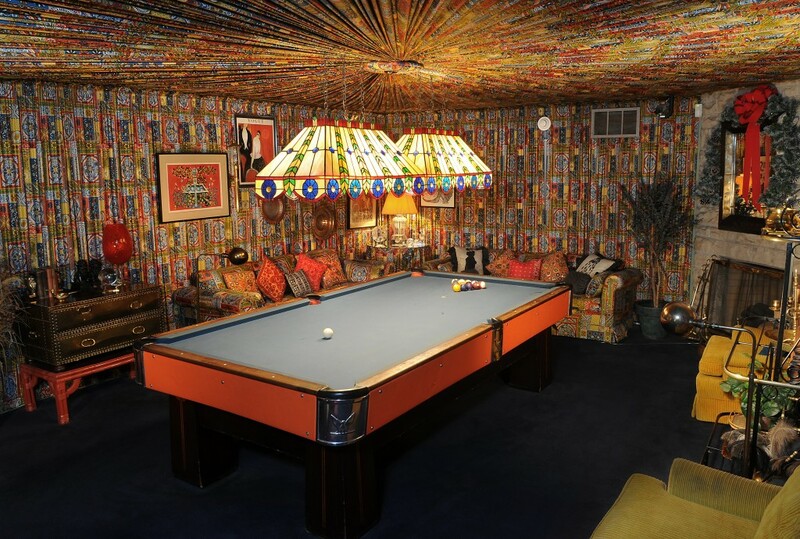 Overall the house has been described as gaudy, phony, poor taste & even “straight out of the brothel.” However, just like Elvis’ music, the house was a creative piece of art — he incorporated his personal style at every opportunity. It’s very reminiscent of the gorgeous Madonna Inn in California— check out the post Aunt Pam did here. As you probably know, Elvis passed in Graceland in 1977 and was buried in the meditation gardens with those he loved most. The house was opened to the public as a Museum in ‘82. 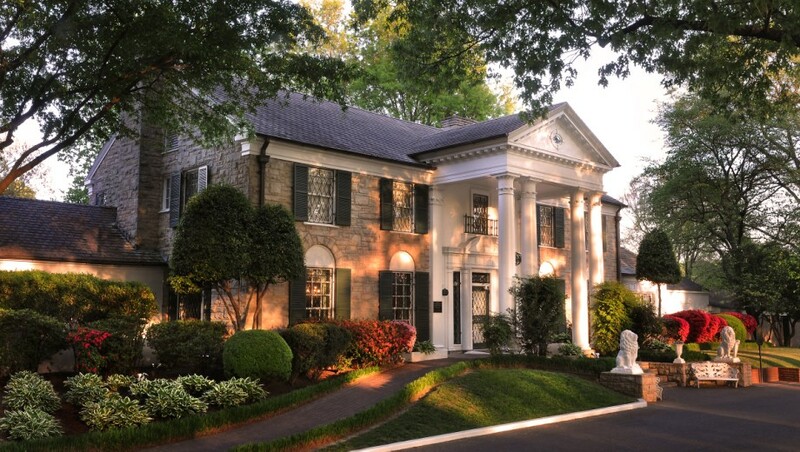 Since Elvis purchased the home, it has gained 7,000 sq ft, been recognized a National Historic Place in ’91, a National Historic Landmark in 2006 (the first site related to rock n’ roll) and ultimately become the second most visited private home in America with over 600,000 visitors a year. Only beat by the White House, of course. Thanks so much to the Graceland staff, especially Robert, who provided the images — please visit their website it you are interested in anything Elvis. We visited Graceland on our honeymoon. I thought it would be a cheesy roadstop attraction, but by the end I was crying at Elvis’ grave. You really get a sense of what a kind and generous person Elvis was when you visit his home and grounds. More than any other historic house in America, you feel as if you have stepped into his life and home. I just saw Graceland on Thursday. The kitchen sink is avocado. The fabric on the walls and ceiling of the poolroom is gorgeous. The TV room is done in navy blue and lemon yellow. One area had green shag carpet on the walls and ceiling. I was anxious to see the Witco furniture, and it was dreamy! PS…Elvis’ parents’ room is on the first floor. 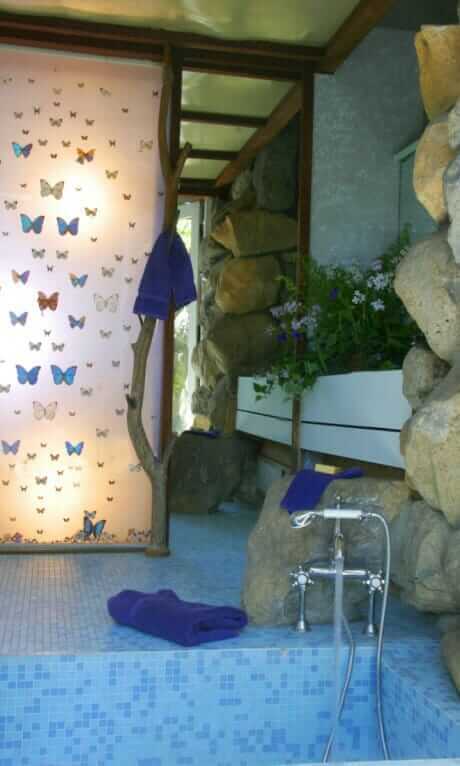 You can only see a small part of one bathroom wall, and the tile is definitely pink! Pink poodle wallpaper in that bathroom! Yes, pink poodle wallpaper in Glady’s bathroom! And a beautiful deep purple bedspread. Gorgeous! Sputnick light fixture in the hallway by the staircase. Gorgeous! 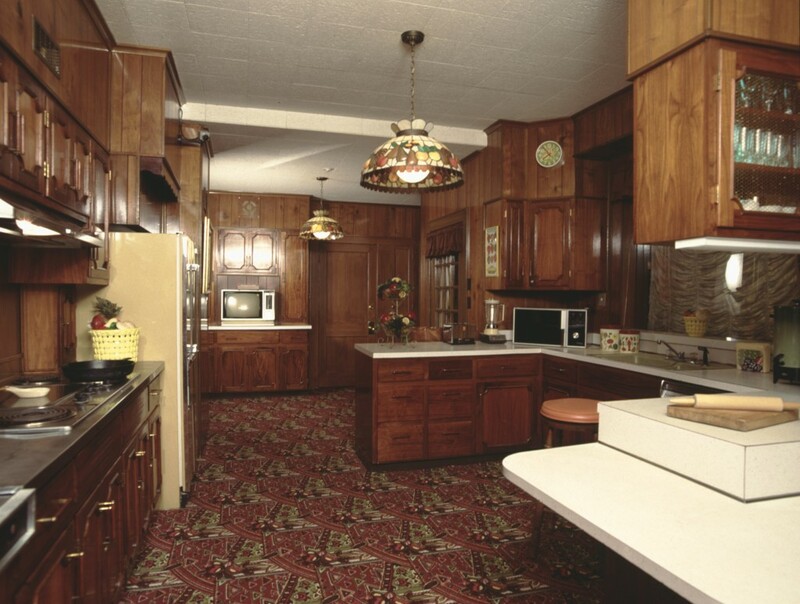 The kitchen is a 70’s dream! The whole house really is. I actually enjoyed my tour there. He had his own style and he dared to show it. I admire that! One very bored father and uncle loaded us kids into the car on a cool, rainy afternoon in Memphis and drove over to Graceland. The gates were closed. Elvis’ Uncle Vernon walked out to the car, spoke to my Uncle Woodrow and we were allowed to drive in. I remember the lions but the house seemed much smaller. The driveway was lovely, curved and graceful, with big trees. Having spent our lives living in shotgun shacks built on squares of land in the middle of cotton fields it was impressive and really did seem like a fairyland sort of place. I was told that when we saw Graceland, Elvis was in Vegas filming “a movie with Ann-Margret.” So that makes the year what? 1962?